If you make it all the way to the remote Strawberries, why not take the opportunity to explore Eastern Oregon. I have driven by the northern edge of the Strawberry Range on several occasions though the years. Heading to a Rainbow Gathering in Montana back in 2000 and camping out in the Wallowas twice in the last five years, come to mind now. There are plenty of worthy attractions within a few hours’ drive. Below are some of my suggestions. All of which are places I’ve had the privilege of experiencing to some degree, in my 21 years of being an Oregonian. 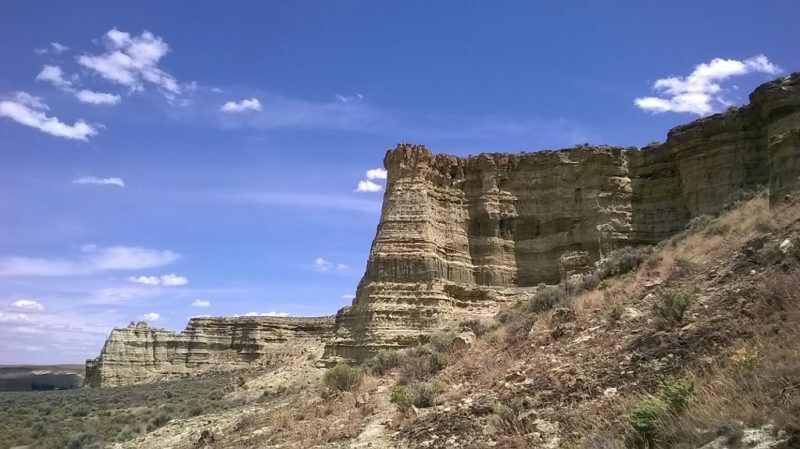 If you merely whizzed by the region as a passenger in a car, you could easily dismiss Eastern Oregon as a generally boring landscape. Nothing but farms and ranches and miles of rocks with few trees and lots of signs that indicate conservative politics. Not exactly the Oregon you had in mind? But do look beyond. There are several different mountain ranges, all with vastly different geology. Small and medium sized towns that proudly carry the spirit of the days when this was frontier land. And enough outdoor adventure to keep you wandering and exploring every day of every summer and still not have seen it all. In fact, on this trip, Lara and I took a quick detour off of route 126 to see the Painted Hills. They are exactly what they sound like. Hills that look like an artist took her paintbrush to them! 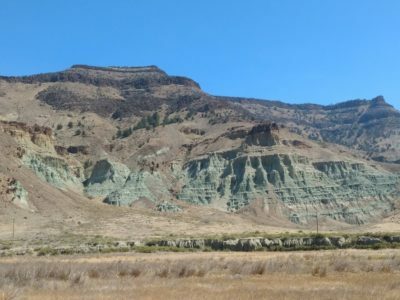 The geology is more complex, but in short, the black, grey and red stripes are the result of mineral and plant deposits that formed when the area was in a floodplain millions of years ago. Now the mountains display a colorful display snapshot, frozen in time. 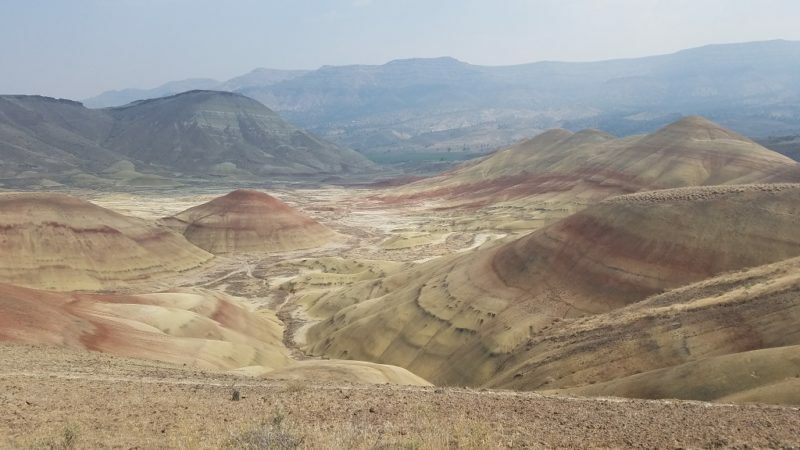 The painted hills are part of the larger John Day Fossil Beds. There are three units and all of them are worthy of a stop. I have done this loop on past trips. There is the Clarno Unit and the Sheep Rock Unit as well. Nearby Mitchell wears the moniker, The Gateway to the Painted Hills. It’s a modest town that I have seen improve through the years. It’s worth a stop to stretch your legs and absorb the vibe. There’s a city park which I have camped at before. Prairie City is the nearest outpost to the Strawberries. 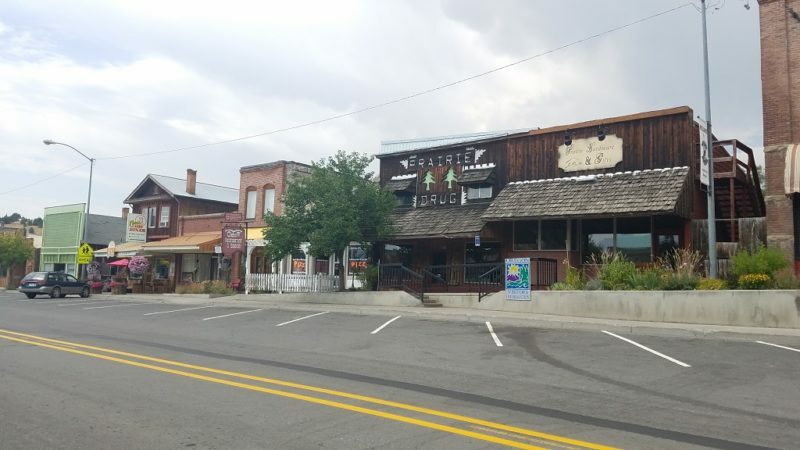 Definitely not a city, but an adorable town with that Old West feeling oozing out at every corner. Hotel Prairie is a historic hotel that used to serve developers from around the turn of the century. Fifteen miles west of Prairie City is the town of John Day. It happened I got stuck behind their annual parade on my way going home. Perhaps the one day a year that the streets are closed and that is when I was there to witness gridlock. The real attraction in John Day is the Kam Wah Chung State Heritage Site. I visited a handful of years ago. It was essentially a Chinese medical clinic from the 1870’s, the period when the Chinese immigrated to the region to help build the railroads. But it was a lot more than that. It was Kam Wah Chung’s home and it also served as a community center for the Chinese. 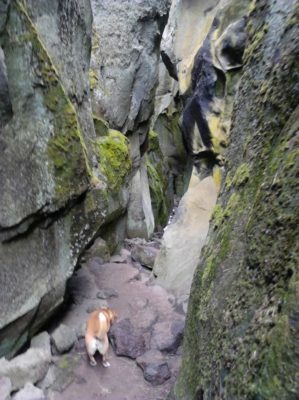 Now it is part of the Oregon State Park system and you can only enter by a tour from May to October. The tours are hourly and honestly, even if you have no connection to this region, I bet you will find it fascinating. The traditional Chinese medicine made from snakes and bats and other unusual ingredients kept me interested from beginning to end. If You Expand Your Diameter to Two to Three Hours, Even More Adventure Awaits. 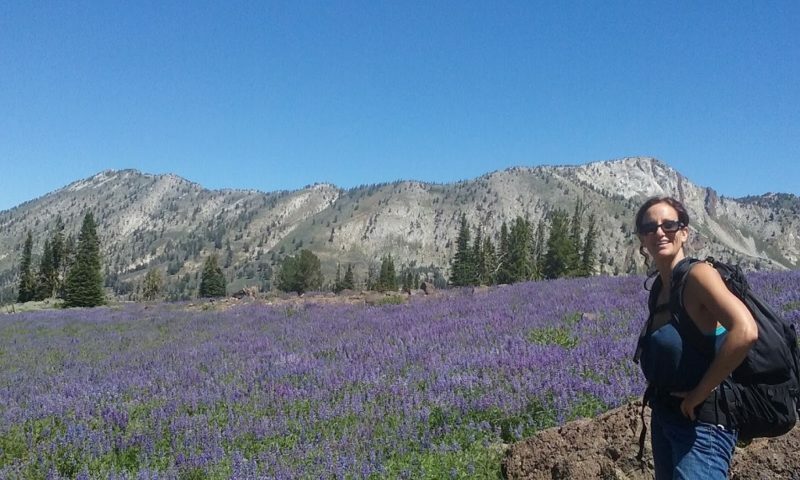 The Wallowas are called the Oregon Alps. The cheese is not nearly as good as in the Alps, but there are far fewer people. I had fun with llamas there a few years ago. And if you are exploring in September be sure to check out the PineFest music festival in Halfway. Halfway is a little town of a couple hundred souls that puts on a fabulous party every year. Boise is reputed to be a total hipster spot with an expanding art and music scene. I spent time there only briefly on my way to the Owyhee Canyon a few years back and did not get to check out the city per se. But I certainly would if I found myself back there again. 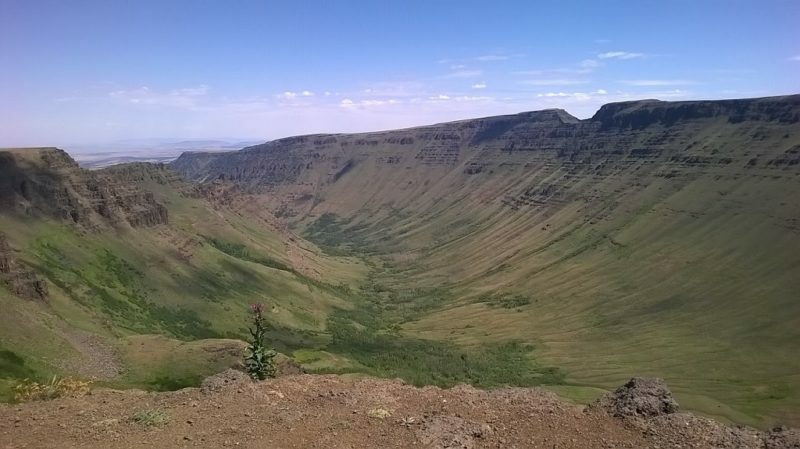 And Frenchglen, the population eleven gateway to Steens Mountain. And the word mountain is used in the singular, not plural. It has an interesting geological history, in short, it is a fault block mountain that has risen in one unit. Lots of hiking there, yet some of the main sights can be reached by car as well. I was happy as a clam when I saw the Frenchglen Hotel sold kombucha, a testament to how awesome Oregon is! Imagine this used to be filled with ice! And, if you have time, don’t limit your explorations to the west side. Drive around to the east side and experience the mountain from the Alvord Desert. The serene and majestic beauty and hot springs will award you for your effort. I took a less common route home from the Steens, and immersed myself in the magic of the National Antelope Reserve and Hart Mountain Hot Springs. I caught a glimpse of just a few antelope, but still, how cool is that? The hot spring is closer to a warm spring, and would not warrant a visit just to soak in the water. But the surrounding scenery is mystical, especially when a storm is brewing. And campsites are abundant. And lest I forget, Bend, Central Oregon’s city of choice. Which happened to be where we departed from the morning we drove to the Strawberries. Bend has restaurants, music, art, 260 days of sunshine, skiing, enough breweries to sink a boat – all against the backdrop of the Cascade Mountains, which are within an arm’s reach. There is lots to say about Bend. So much so, I may dedicate a blog post to it in the future. But for now, I want to suggest a few of my favorite restaurants and things to do in the city. Arianas is upscale Northwest cuisine. 5 Fusion and Sushi Bar is upscale and creative. Wild Rose is Northern Thai food and not your standard Thai fair. El Sancho dishes out tacos that are tasty, quick, inexpensive and pack a punch. Drake Park runs alongside the Deschutes River downtown. Pilot Butte can be driven or hiked. Hiking is about a mile and however you get to the top, you’ll be rewarded with a 360 panoramic view of high desert scenery. Treat yourself to an hour in the Turkish Style Soaking Pool in the Old St. Francis School. If you spend your days hiking the Cascades, then a soak becomes not a treat, but a necessity! 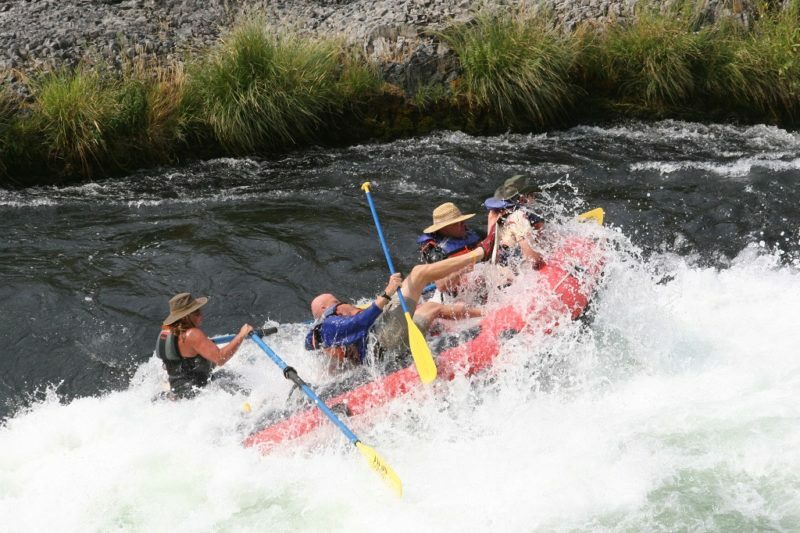 Maupin is close to Bend and where I put in when rafting the Deschutes. A super fun thing to do, as you can see below. And Just a Touch Further. . .
Named after Hawaii, this seems to be the region of Oregon that Oregonians know nothing about! Probably because most Oregonians live in the northwest corner of the state in the Willamette Valley. And the Owyhee Canyon is in the far eastern part of the state. If you are attracted to dramatic scenery and want to have it all to yourself, then you will love it here. The Pillars of Rome are especially awesome. Which happens to be a wonderful place to visit in the winter as well. I went one year for Christmas and I had a ball exploring the surrounding region with all its otherworldly geology. The lake fluctuates with the seasons. If you want to see the Summer Lake itself and the flocks of birds that it attracts, then spring is your time. Summer Lake Hot Springs has rustic cabins, ideal for winter. And campsites for summer. The nearby warm mineral water flows into a man-made pool, which you are free to enjoy. Heading west from Summer Lake, take note of these geological formations: Crack in the Ground, Fort Rock and Hole in the Ground. It is all really very weird and fascinating. You may not want to return home. 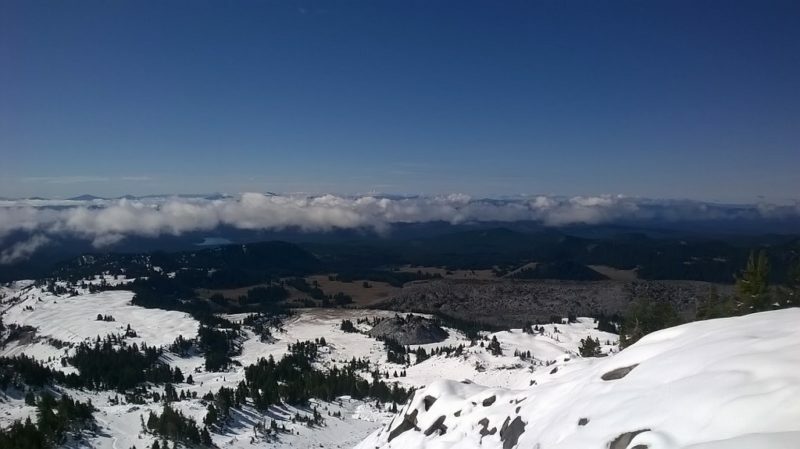 There are lots of nooks and crannies beyond what I listed, but I hope I have made a good case for exploring Eastern Oregon.